In Malcolm Mackay’s Every Night I Dream of Hell, the anti-hero lives in the shadows of the Glasgow underworld. An insider in a criminal gang known as the “Jamieson Organisation,” Nate Colgan thinks he has seen how bad it can get. 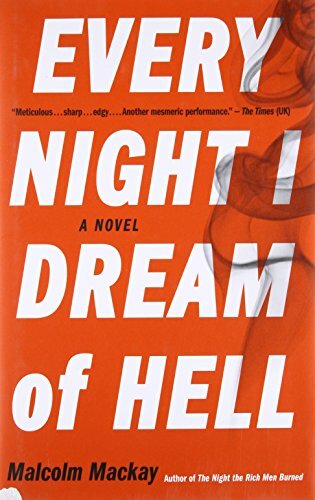 Published in the U.S. this April, Every Night I Dream of Hell is the latest addition to a sprawling field of work labelled “Tartan Noir,” a term said to encompasses works from disparate group of authors — including Denise Mina, Ian Rankin, and Peter May — it’s scope ranging from the highlands and islands to Scotland’s major cities. He’s right. This small rainy country with a population of five million spawns many different kinds of crime writing, from the cynical humanity of Ian Rankin and the mocking insights of Alexander McCall Smith to the fiery social and political conscience shown by Denise Mina. It seems an insulting act to shoehorn them all under the umbrella Tartan Noir. Rankin, the king of Tartan Noir, who coined the term in a meeting with James Ellroy, thinks it is a catch-all which cannot do justice to the rich variety of crime writing coming out of this small and rainy country. How does this glamorous medium created in a shimmering city translate to Tartan Noir, then? Noir is gangsters and glamour and beautiful blondes in a glimmering, sprawling city. It is Ellroy and Chandler and the horror of Roman Polanski’s Chinatown. Tartan is the pattern on shortbread tins, or the hairy friendly blanket my dog sleeps on. There’s a something of a disconnect between the warmth of Tartan and the broken-glass cold of noir — and that makes the term work. “I think a lot of Glasgow’s reputation comes from how it used to be,” says Mackay. A native of the Scottish Island Lewis, Mackay had only visited Glasgow once before writing his first novel, The Necessary Death of Lewis Winter, part of a trilogy set in the city. Would he write a crime novel set in the island town where he lives ? He laughs, Stornoway’s a small island, and while he likes to live there, he doesn’t see it as a Mafia hotbed. This doesn’t mean the islands are not written about by crime writers. Peter May used the rugged isolation to write a trilogy set on Lewis, the loneliness and exposure of the island perfect companions for a haunted detective. The May novels may lack the urban hardness of Mackay’s stories, but May’s Lewis trilogy has a soft-focussed menace, as though seen through wind and the driving rain that is so frequent on Scotland’s Western Isles. Los Angeles and the Scottish Islands may seem a thousands of miles from one another (figuratively as well as literally), however they both share a certain allure that fuels the imagination, perhaps more so even for those who have never been there. That one term could encompass both writers seems improbable — but both personify Tartan crime, with a glamour that sees the glimmer of a puddle rather than the ritzy glitz of bright lights and diamonds. I know this country — I have lived here half my life, and I know how the light can change in an instant, how everything else here is changeable too, how Scotland is a nation of bleak grey skies and brilliant sunsets, cities where motorways slice confusingly through the middle and places that look so remote and crater covered they could be mistaken, in certain lights, for the moon. Hope Whitmore is an aspiring writer and librarian who lives in Edinburgh and draws inspiration from the lovely old books in the annex. She loves interviewing authors, writing stories, and taking notes on scraps of paper. According to a recent study, 38 percent of Christians say “capitalism is at odds with Christian values.” Those findings echo a stubborn tension between Christianity and capitalism in American life, an uneasiness that shows up repeatedly in American fiction. Brilliant and informative piece. If you like writing, if you like writing and reading, especially a good story told well, Hope lays out Tartan Noir well enough for one to make a choice and go out a give a title a whirl. Well I’m not surprised by this because I looked Hope up after seeing a Tale of Two Sisters so impressed I was with this young lady’s gift. Far from dry she expresses insight, conveying an intimacy for the details. What a plot synopsis of The Brothers Karamazov reveals is how Dostoevsky managed to hang a book of profound questions on some of the most hackneyed conventions of fiction: the murder mystery, the love triangle, the courtroom drama.